How do you cater for disabled passengers? Why have we to pay a booking deposit if it’s free anyway? When can I go on a trip? Where do I park and board the boat? What about refreshments during the trip? What if we need to cancel our trip? 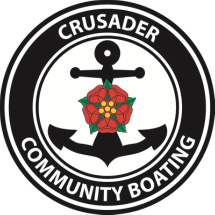 How is Crusader Community Boating funded? How can I help with funding? Do you run private trips? Our boat is wheelchair friendly and has a disabled toilet. Passengers with mobility issues are able to remain onboard for their lunch stop if required. For qualifying groups, we do not impose a mandatory charge for our trips but groups may wish to contribute towards the costs of running the service. For all private charter trips, a flat rate of £200 applies for all bookings. We have decided to introduce a refundable booking deposit as a deterrent against failing to take up the booking without adequate notice, thereby denying others the opportunity of using the boat. During 2019, trips will run between 10am and 3pm on weekdays from 15th April to 12th October, subject to crew availability. Once your booking is confirmed by us, your date is secured - see Terms & Conditions. On-street parking is normally available immediately outside the loading point at Blisworth Arm. For weekend trips, you will be notified of alternative arrangements. The boat has facilities for serving hot and cold drinks. Group leaders to bring their own supplies. For groups not bringing their own food, we are able to incorporate a lunch stop at the Wharf Inn, Bugbrooke. Menus are held onboard and food can be pre-ordered during the morning to save time on arrival. Where preferred, passengers can dine onboard. Please select pub visit when booking your trip. See details in your booking confirmation email. Please ensure that the staff running the trip on the day have a copy of your booking confirmation. Through voluntary donations, corporate sponsorship and grants. If you have any suggestions regarding our fundraising or if you think you could help in any way, please email us. Yes. We run a limited number or private and corporate trips as fundraising events for our charity. For further information, please email our Boat Manager. Please contact us via the ​Contact page of the website and we'll get back to you as soon as possible.